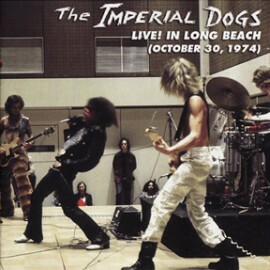 Sixty-four minutes of incredible footage from legendary rock scribe Don Waller's LA/South Bay proto-punk outfit recorded live at a college in Long Beach, California! Contains previously unreleased versions of 10 Imperial Dogs originals plus covers of the Kinks, the Velvet Underground, and Mott The Hoople. Includes a 20-page, full-color booklet with 15 rare photos and extensive liner notes. Dolls/Dictators/BOC/Radio Birdman/Stooges fans...YOU MUST OWN THIS!!! There were at least 250 people in the audience that fateful night 'cause -- by charging everyone one whole dollar each to witness this insanity -- we got paid $250 that evening. In all fairness, it's hard to tell this was the case 'cause the show was shot by one camera on a tripod to the front and right-hand side of the room, so a lot of the audience is actually behind the camera. But you're right, Ray Charles, about the audience not getting it. Heh. However, having to keep all the lights in the room on so the performance could be videotaped certainly inhibited the audience -- and the band felt like we were playing under a microscope. And ... the girl seen dancing on the videotape is NOT the girl who got us the gig, got it videotaped, and had the foresight to purchase the tape. That was Linda Pascale, the true heroine of this tale. None of the I-Dogs nor any of the half-dozen other people who were there that night and have seen the tape/DVD can identify the girl who's dancing. As far as the sound quality goes ... We were playing as loud as possible, which is why we're constantly battling feedback. Again, you can't see that the entire wall of the room that's behind the camera -- one side of the rectangle as it were -- is nothing but plate glass windows. Also ... there's no soundboard. So what you're hearing is what the microphone attached to the videocamera captured. Got to hand it to whoever engineered that system 'cause it surely wasn't designed to capture a rock 'n' roll band playing at Papalordgod's own volume. However, because the sound was recorded on half-inch, reel-to-reel tape, it's better than anyone could expect. Like you said, play it LOUD!